When progressive rock pioneer Steve Hackett starts his “Steve Hackett Genesis Revisted, Solo Gems & GTR 2018 Tour de Force” on Saturday, Feb. 10, he will have nearly 50 years of material from which to choose his setlist. 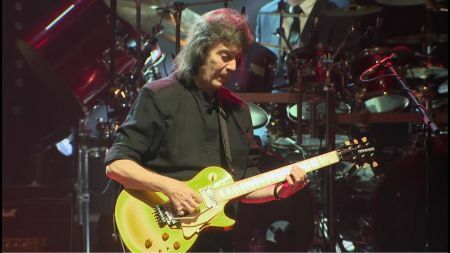 The iconic guitarist will be honoring the 40th anniversary of the first solo album he did — Please Don’t Touch — after leaving Genesis, as well as some classic tracks from his time in the band. Hackett spoke with AXS.com in a midtown Manhattan hotel, shortly before he headed off to play 2 shows a night on the Cruise to the Edge, from February 3-8. He’ll be joined by a number of artists — such as YES, Adrian Belew Power Trio, and Carl Palmer’s ELP Legacy — as the ship sails from Tampa, Florida to Belize and Costa Maya (Mexico). After that, he will kick off his extensive tour on Feb. 10 in Quebec and end on March 25 in Brazil, after making stops throughout Canada, the United States, Mexico, Chile, Argentina, and Peru. Tour dates and ticket information are available here. Hackett also spoke about his new bass player, Jonas Reingold. He praised the versatile Swedish musician as “a powerful presence” whom he heard play Bach on the bass. Although new to the band, Reingold has been quickly learning Hackett’s extensive catalog. “We ended up rehearsing ‘The Steppes’ and Jonas got it right the first time. We’ll do it in soundcheck probably at some point and see if it makes sense [to add to the setlist],” he said. After the 24-date North and South American tour, the guitar legend and his band will play two shows in Japan in April and one in Spain in June. In early October, he will perform six shows with a symphony in the UK, featuring Canadian conductor Bradley Thachuk. While the work in progress is mostly a rock album, Hackett draws from his extensive background and eclectic tastes. Classical, orchestral, choral, and even Indian music are among his current influences for this project. These days, when he’s not writing, recording, or performing, he listens to a wide variety of music — from blues guitarist Joe Bonamassa and alternative rock bands Muse and Elbow to classic rock mostly from the 1960s.